While Olympic athletes are going for gold medals in South Korea, boxer from all over the USA have started their hunt for gold in the National Golden Gloves Tournament. Thirty Cities around the country have started their preliminary bouts at the local level with Washington D.C. being the hub for Maryland and Delaware. The tournament is being held at the Rosecroft Raceway in Fort Washington MD. In the first week of elimination bouts, Main St Gym’s Markeese Hines won a solid victory over Brilyen Kelly of Langdon. Hines combined solid body shots with slick defense that eventually caused the referee to give Kelly a standing 8 count. Also winning from the Eastern Shore was Jerry Shockley fighting out of Down Under Boxing who won on points over Daniel Holmes from Old School Boxing in DC. The preliminary bouts will continue at Rosecroft on Feb 24th, March 3rd, March 10th,March 24th, with the State Championships on April 7th. Besides Hines who fights in the 152lb novice division, five other Main St. Gym Boxers are entered in this, the most popular amateur boxing tournament in the world. In the Junior division is Erick Acosta fighting at 126 lbs. of Salisbury and Jordan Brown fighting at 132 lbs. of Delmar. Three Main St boxers will compete in the Open Class Division, Cory Moore at 152 lbs., James McMurdo in the superheavyweight division (200lbs plus) and Thomas Mottinger in the heavyweight (200lb max)division. Both Mottinger and McMurdo have won regional championships in the novice division in the past years. All boxers will vie for State and Regional Championships with only the open class boxers eligible to compete for a National title to be held this year at the Ralston Arena in Omaha Nebraska. On Saturday evening April 7th, the best up and coming fighters from Maryland, Delaware and Washington D.C. converged on the Rosecroft Raceway for the finals of the 2018 Washington DC Golden Gloves Championships. After five weeks of preliminary bouts, only the best of were left to face off for the title of Golden Gloves Champion. Although a large number of the boxing gyms entered are from Baltimore and D.C. , Salisbury was very well represented. Of the ten novice weight classes, one of the spots was filled by, 152 lb Main St. boxer Markeese Hines. Of the ten open class weight divisions, Thomas Mottinger at 200lbs and James McMurdo representing 200 plus were out of Main St. Gym. In the last bout of the evening, Prince St Elementary school teacher, James, “Matt” McMurdo or Mr. McMurdo as his students know him. Battled in a crowd-pleasing display of power and determination, but was unable to outpoint 6’6” Malik Titus fighting out of “Time To Grind Boxing” in Baltimore. The six time Golden Glove Champion drew on his experience to deal with the fierce punching power and unrelenting pressure McMurdo kept on Titus through the entire fight. “ Matt worked very hard for this fight and this was his first open class appearance in a tournament. He fought one of the best in his class and we knew Malik’s experience was going to be a factor, so we just tried to stick to our game plan and take him out of his rhythm as much as possible. Matt was successful at times but Malik’s experience let him make the right adjustments to get the win. Malik has a solid shot at winning it all at the national level.” Said Chernoff. “ We entered five fighters this year, and came away with two gold medals and three silver medals, that is something we are all very proud of. They represented Main St, and more importantly Salisbury in a big way. Join us for Concert in the Ring IV on Saturday, February 24! Location : Main ST Gym 310 Bowl Dr.
Main St Gym took 15 members on a tour of Salisbury University. The kids had a great time and some that never considered secondary education are now talking about college. 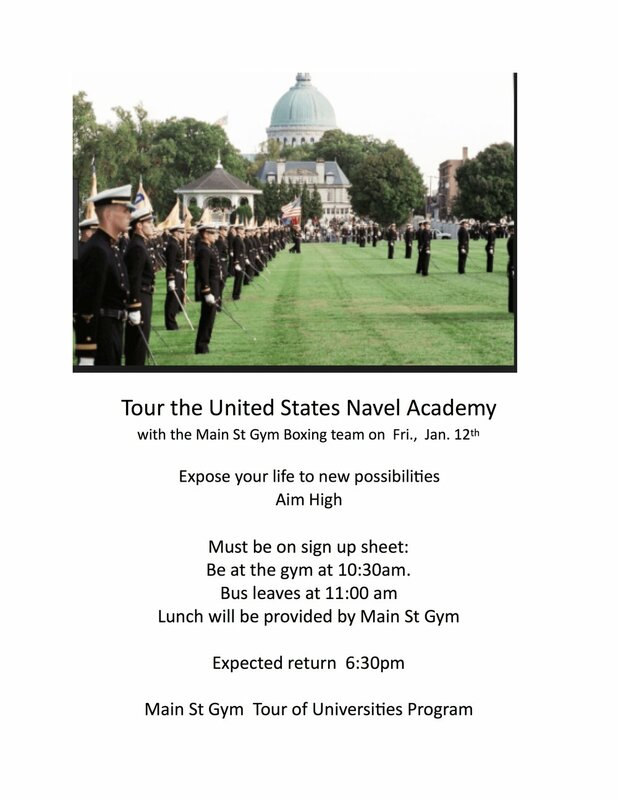 Next Main St Gym College tour will be at the US Navel Academy on Jan 12th. Across the country and in cities like New York, Dallas, Cincinnati and many more, the oldest, most popular boxing tournament in the history of the sport has begun, the 2017 Golden Gloves. Started back in 1923, the Golden Gloves began when a sports editor of the Chicago Tribune wanted to have a citywide tournament to find the best amateur boxers in the city. In 1927 Chicago challenged New York City in a competition and soon cities across the nation were holding Golden Glove Tournaments. Eventually it got more organized and boundaries were drawn to hold city championships, regional championships and finally the National Golden Gloves Championships. The names of Golden Glove Champions are a list of the who’s who of boxing, including, Joe Louis ,Sugar Ray Robinson, Sugar Ray Leonard, Muhammad Ali, Thomas Hearns, Oscar De La Hoya, Evander Holyfield, Marvin Hagler and many more. The Washington D.C. Golden Gloves got under way last week at the Rosecroft Raceway in Fort Washington, MD., and will have bouts each Saturday evening until the Championships. This year, Main St Gym of Salisbury has eight boxers entered in the event. There are three basic divisions. They are junior, novices, and open class. Only Novices and Open Class advance to the Regional Championships and only Open Class are qualified to advance to the National Championships. Last Saturday, two of Main St. Gym’s boxers were entered. Brendan Naranjo walked away with the 2017 132lb Junior Championship, and in Novice Division, Markese Hines got a solid win to advance in this week's competition. Competing this Saturday, February 25, will be the brothers, Jordan and Gavin Brown of Delmar, and Russell Griffith of Salisbury. Waiting for their division to start are Salisbury’s Corey Moore in the 152lb Open division, James Mathew McMurdo, a Prince St School teacher, and super heavyweight in the Novice division and Thomas Mottinger, who who last year’s Regional Novice Golden Glove , is fighting this year in the open class heavyweight division. Main St, Gym is hosting our third annual “Concert/Dance in the Ring III”. With the help of our Major Sponsor Pohanka Of Salisbury this will be another great event. This is our major Spring Fundraiser and it happens on Sat March 11th with the doors opening at 6:30 and appetizers at that time, Then a Buffet Catered by Chef Stuart of Flannery’s and the show kicks off of the show at 7:45pm. This year Coach Hal will MC the show and we were very fortunate to get the very popular band “On the Edge” one of thee best cover dance bands in the east central region. The Main St. Gym program has grown each year and is closing in on capacity attendance each night. A large make up of our kids cannot afford dues, equipment, registration, or a combination of all three, and because of events like Concert in the Ring we have never turned away one young boy or girl for financial reasons. We take great pride in being able to keep these kids in the program and growing in the right direction through our highly disciplined program. We would love to have you come out this year and enjoy the evening. At present we are 2/3 sold and a table of 8 seats is $350. Individual ticket are $45 each and all tickets include appetizers and the buffet. There is also a full cash bar. So done wait and give Coach Hal a call and lock in a table. Like all that have attended before,,,You’ll be glad you did. Other contributing businesses: Yard Designs, Sysco, Justin Darling “That DJ Guy", & City Florist. The venue will be the Main St Gym on Bowl Dr. and the Host Hotel is Hampton Inn on Naylor Mill Rd. There will be food music and some of the best amateur boxing in the country to see who will advance to the National JO Tournament in West Virginia. States represented are PA, NJ, DE, MD DC. and VA.
Tickets are $20 for 1day or $35 for the tournament. Harlem Beteck With his winners trophy. Jake Plamer Getting his hand raised in Victory. Russell Griffith with his opponent after a hard fought battle in Baltimore. Erick Acost in headgear warming up for his bout. Main St Gym Boxers posing before going in different directions to compete. Two Main St Gym fighters climbed out of the ring Saturday night with the Washington D.C Golden Glove Championship in hand.. Both battled formidable opponents to victories and secured a trip the regional championship. James “Matt” McMurdo stepped into the ring in front of a packed house at the Rosecroft Racewaywith cheers from a contingent of his gym mates, friends and his students as well as the local crowd that has enjoyed watching Mcmurdo’s in his climb to Saturdays nights Championship bout in the superheavyweight novice division. In the opposite corner was Justin Maggi, fighting out of Simon Brown Gym in Frederick MD. Coach Brown, a past world champions boxer that held the Welterweight & light middle weight crowns with the WBC and the IBF could not help protect his boxer from the constant pressure and power of McMurdo’s punches. McMurdo will now move on the Regional Golden Gloves Championships to be held on April 22nd. McMurdo is a teacher at the Prince St. Elementary School in Salisbury. In the open class heavyweight division Main St’s Thomas Mottinger battled to his second Golden Glove Championship in as many years. In 2016 Mottinger won the heavyweight novice division and now he has won the 2017 open class heavyweight division, earning him a trip to the Golden Glove Regional Championship on April 22nd. One more win will send Mottinger to the National Championships in Louisiana. Mottinger was facing a very game and tough Shaka Williams of Nomis Boxing in D.C.. He got off to a slow start in round one andpushed to catch up in the second round. Going into the third round Mottinger pulled out all the stops to step up the paceand dominate the round decidedly, securing his victory . Mottinger is a Realtor with Maggio Real Estate in Rehoboth Beach Delaware. Coach Hal Chernoff alongwith assistant coaches Tyrone Hargrove and Ryan Watson worked both fighters corners. “The guys were both a little tight tonight with this being the championship night. They both worked very hard to get here and the pressure of being in the Golden Gloves can create an added stress that can take you out of your game a little,” said Chernoff. “Both these young men gave all they had to get this win and move to the next level. They beat the best fighters in DC, Baltimore and the entire state. This area has some of the best gyms and trainers that have produced some of the best fighters in the country. At the tournament is a big banner with all the fighters that have won the DC Golden Gloves and it looks like the who’s who of boxing champions. Past world champions like Mark “Too Sharp Johnson who was on hand watching Saturday night and Sugar Ray Leonard, Chop Chop Corley as well as current world Champions like Gary Russell, Geovante “Tank” Davis andLamont Peterson who was also on hand to support his team mates. So this is a big wing for these two guys as well as our young champions, Gavin Brown, Russell Griffith and Brendan Narrango that won their championships earlier in the tournament..
On the championship night of the Washington D. C. Golden Glove Tournament, a committee of organizers and officials got together to decide who should get the single Sportsmanship of the Tournament Award. It is given to the boxer that has displayed real sportsmanship in the tournament regardless of winning or losing. This year Main St Gym’s 9 year old Gavin Brown fought a very tough battle against Khyrie Proctor of DC with Gavin emerged victorious. But what really pleased the crowd, officials and his coaches was the sincere embrace of his opponent at the end of the bout and the way both of these young fighters showed true sportsmanship, maturity and respect by immediately going to their opponents corner to congratulate opposing coaches on a job well done. For that reason the 2017 Sportsmanship Award was given to both of these young fighters in a testament that the sport of boxing has always helped to build respect for yourself and those around you. Gavin is a student at Delmar Elementary School and is the son of Christy Spindler and Ryan Watson who is an assistant coach at Main St Gym. Main St Gym had a total of 5 boxers win this years State Golden Glove Championship and we are very proud of all of them, but having a boxer win this award mean a great deal that goes beyond scoring a point or two more than your opponent. It means that men and women involved with boxing outside our area are able to recognize that our kids are taught to respect their opponent and their entire team win or loses. It shows that our work to instill character in our kids and especially in Gavin’s case has succeeded. It makes us all that much more proud of his performance. Girl Scout Troop #86 Tours Main St Gym! What a great time we had when Girl Scout troop #86 came to tour Main St Gym and get a full boxing workout. It was to show that girls can do anything they set their mind to and let me tell you these girls were focused and learned very quickly. They all enjoyed it and we enjoyed teaching them. I want to thank all my young boxer that assisted me for the night., it made a huge difference, especially when my girls stepped in to help. Thank You Sarah Truitt for coming up with the idea. Main St Gym's Christmas Party started out on the lanes and finished at Delmar Pizza. All the kids got gifts and to my surprise so did Coach. Thank you al for my new Main St jacket. I Love it. Open Gym at Main St. Gym had lunch, games, and then an afternoon of bowling for all the kids! Main St. Gym's Thomas Mottinger wins tie breaker against Stephan Macray of Baltimore, MD. Macray had just returned as the Champion of the Ringside world Championship in Kansas. Coach Hal gets certified in "Rock Steady Boxing", a program to help train people with Parkinsons through boxing workouts. The program will start this summer, check out Rock Steady Boxing for more information on this amazing program. Main Street Gym Boxing Club-Maryland State Junior Olympics' Baltimore MD. Upton Boxing Center. Main St Gym was in Baltimore Saturday evening (April 23, 2016) for the Maryland State Junior Olympic(JO) Finals. Two Main St boxers, Jordan Brown and Erick Acosta stepped into the ring to take on opponents from D.C. and Baltimore respectively. Brown, who had already made the Regional finals was matched up as a tune up fight for the Junior Olympic Regionals to be held in Salisbury on May 13th and 14th. Brown a Delmar Middle School student fought Robert Shackleford from Old School Boxing in Washington DC. Although he lost a close decision on the judges' cards, this fight can help him in the Regionals. Erick Acosta of Main St. Boxing Club, met Quadir Mathews, out of Upton Boxing. Acosta came out very aggressive and took control early. He was very sharp both defensively and offensively giving little if any target for his opponent and landing solid punches throughout the bout. " Both kids did real good tonight" Said Coach Hal Chernoff, "I am excited to see what they do in the JO Regionals. Acosta has gone through a growth spurt both mentally and physically. He seems to be more focused and is getting stronger as he grows. Brown is getting more and more confidence with each bout which can help him to take charge early in the fight. Kobe Moore received a walkover win and will fight in the 145 lb. weigh class in the JO's in Salisbury. Moore has been in the gym longer than the others and has been a slow starter, but is coming on very strong now so he is exciting to watch. He is very strong and has heavy hands. Moor, the once little kid that started 8 years ago is getting bigger than his Coach, in fact they all are and that's fun to see. I am excited for these kids. I wanted very much for them to be able to fight in Salisbury in the JO Regionals, but you have to earn it and they did. Now their families, friends and teachers can see what they have been working so hard for over the years. It's nice that Main St Gym and Salisbury will be represented by these young men. The will also be representing their schools, Wi Hi, Bennett Middle, and Delmar Middle. So I hope to see some school pride on May 13th and 14th.